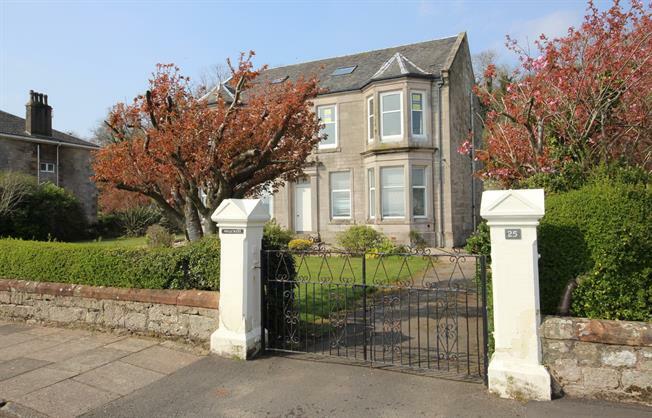 3 Bedroom Flat For Sale in Isle of Cumbrae for Offers Over £170,000. Hillcrest is a most imposing traditional building enjoying a prime, level location on West Bay and encompassing fine sea views across the bay. This first floor apartment also has a converted attic and as a result now offers generous and highly adaptable accommodation which will be of appeal to a broad market sector. Upgraded and modernised in recent years by the current owners, viewing reveals: reception hall, bay lounge, separate rear facing kitchen with appliances, tiled shower room and two bedrooms completes this level. Upstairs leads to the master bedroom with en suite bathroom and second lounge/bedroom four. The property has electric heating and double glazing. All rooms have either sea views or woodland aspects. Communal drying green and garden area to the rear. The Isle of Cumbrae, is roughly four miles long is a highly popular Island situated on the West Coast. A hugely popular holiday destination with a broad choice of pursuits for all ages. All- year round ferry service which is around 10 minutes from Largs.